Everyone should live in Italy for at least a little while. I lived there for a couple of years in my twenties and it was transformative for all those reasons you might expect: fresh seasonal food, friendly people, beautiful surroundings. It was transformative for other reasons as well, but let’s stick to food. The Glorious Vegetables of Italy! My first job there was picking grapes and apples in the Trentino part of Trentino-Alto Adige, a semi-autonomous region just south of Innsbruck, Austria, at the foot of the Italian Alps, within sight of the Dolomites…crispy cold at 7 a.m., warming Schiava dry rosé wine and ham and cheese panini at 9 a.m. The church bells echoing around the valley at noon made us drop everything and run for la pasta asciutta laborers’ lunch with more schiava and café corretto (“corrected” with sambuca or grappa)…singing opera in the trees…big Sunday family meals, ridiculously everything you might expect, including the hard work seven days a week all season. One of the things that astonished me was how differently they treated vegetables – not just as an overcooked side to the more important meat dish — but with respect and zest and creativity. They were complex flavor and texture experiences, enhanced by often being straight from the farm. Who knew? I certainly didn’t. Steam basket. We steamed first and did a little more chopping later to create more nooks and crannies for the other bits to cling to. I reluctantly close the window on that memory (before I kick myself for the many things I didn’t learn when I was there, when I should remain rapturous about the things I did and before I bore the hell out of you with my nostalgic ramblings) and turn to the present. Domenica Marchetti, a classmate of mine from Columbia Graduate School of Journalism, is genetically predisposed to channel those Italian flavors I remember. Her mother is from Abruzzo and her father from an Italian-Rhode Island family and she spent her summers in Italy in the embrace of a flurry of aunts and their kitchens. After several years of covering the gore and complications that reporters regularly cover and running home to spend all her free Domenica-time elbow deep in cookery books and pots and pans, she put due più due insieme and started writing about food instead. I actually took mine to work and hid in my office so I didn’t have to share…this is before I got the cheese on. Domenica’s latest cookbook (they now number five!) 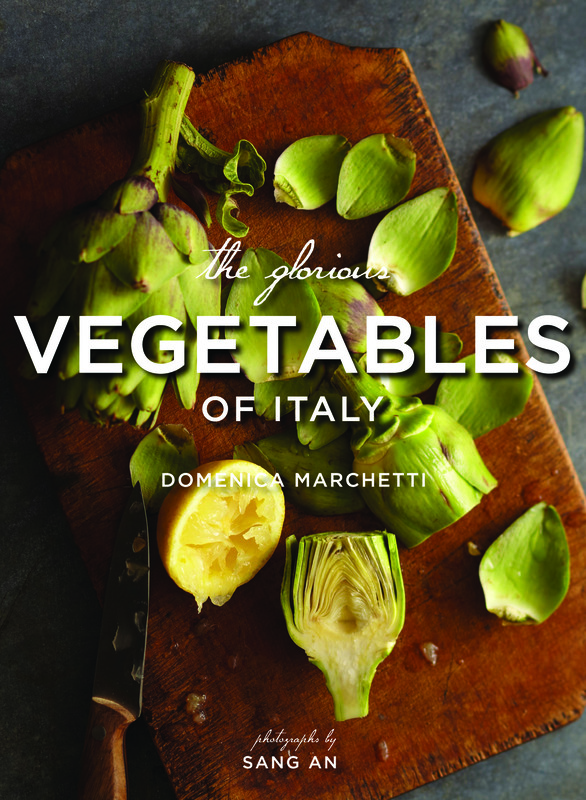 is The Glorious Vegetables of Italy and it is big and gorgeous and glorious indeed (In case you don’t believe me, it is a New York Times Notable Cookbook). You might need one for the coffee table and another to dog-ear and stain and love up in the kitchen, because the images, by Sang An are delicious and you won’t want to get them messed up when you cook! My Sunday cooking companion, Marianne (herself no slouch in the Italian kitchen) immediately decided we had to make the Winter Cauliflower Salad. And we did and it was so robust and delicious and just the perfect way to end this frigid winter to end all winters. Lots of good stuff in here! So there you have it. And here you have my slightly-adapted version! Here’s hoping I get to see Domenica in person soon to exchange more kitchen tales! In the meantime, you can also follow her blog, which takes you deeper into the everyday kitchen of an excellent Italian cook! 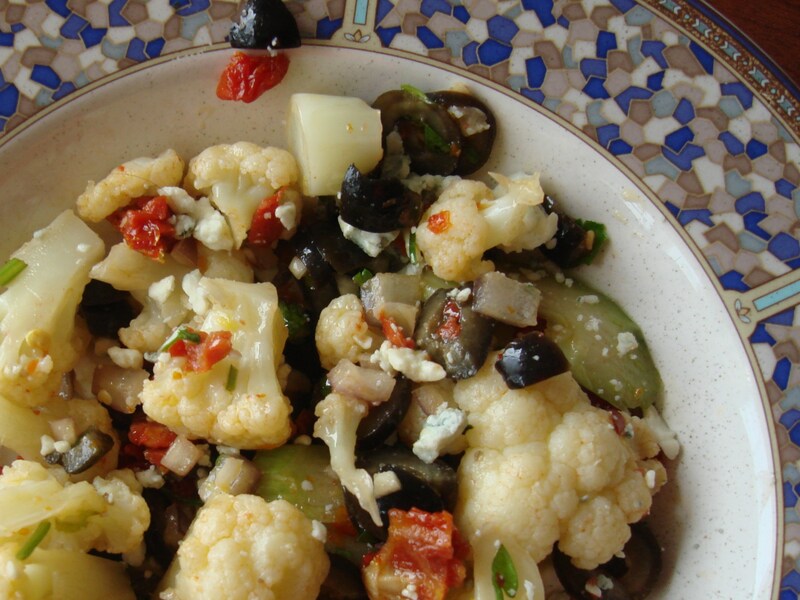 Transfer the cauliflower to a large bowl and add the celery, olives, parsley, garlic, onion, tomatoes and pepper flakes and toss gently but thoroughly. Sprinkle lemon juice, zest and salt and mix again. Drizzle in the olive oil, then cover and marinate at room temperature for 30 minutes or refrigerate until chilled. Fold in the cheese just before serving. ← A Call to Action: Please Vote for My Italian Wedding Soup! Picking grapes and apples! Singing opera in the trees! What a wonderful way to spend one’s time, and what an absolutely perfect way to learn about Italy and its culture. I bet you have some grand tales to tell. I saw Domenica’s invitation to visit your site, and so I cruised on over. You are certainly right about the Italian way with vegetables, and Domenica has done, dare I say, a glorious job of spreading the gospel. Her book is an absolute joy. Your salad looks wonderful. I just came home from our local Farmer’s Market, my bag brimming with multi-colored cauliflower, and now I’ve got some inspiration. Thanks for a wonderful post. It is a pleasure to make your acquaintance, and you’ve got a new reader. Alla prossima! Natalia, what a wonderful memory about time spent in northern Italy. 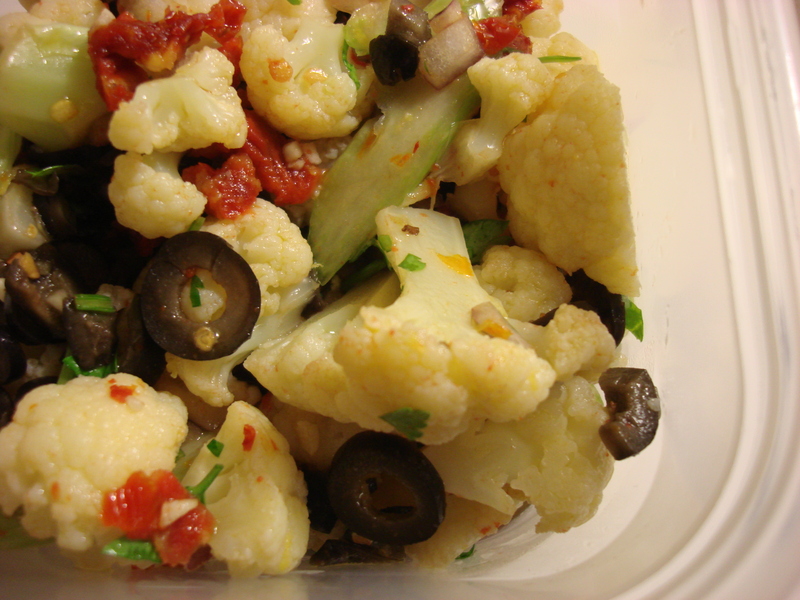 After you told me you were writing about the winter cauliflower salad I had a craving for it. I made it for dinner the other night, as an accompaniment to Italian tomato and bread soup (pappa al pomodoro). 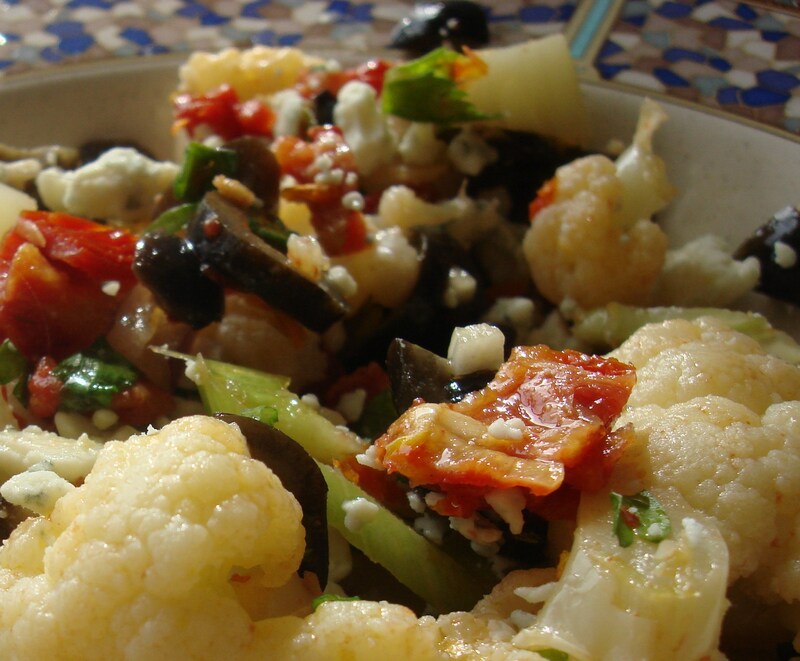 I’m with Cecilia ~ this is a great salad for those of us who are sick and tired of winter and craving good fresh vegetables. Thanks for the shout-out, my friend. Hope you cook from the book often. Un abbraccio! I will have to look into the soup. 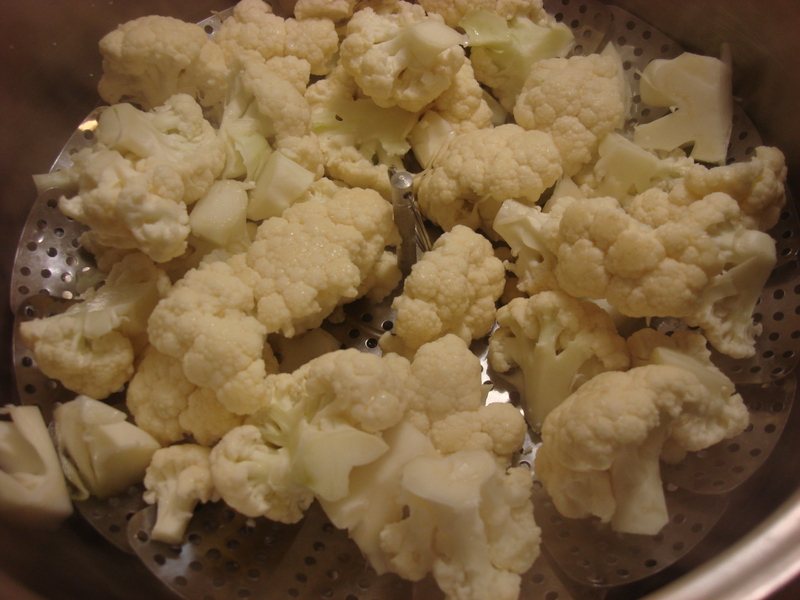 The cauliflower was such a success, I am hungry for more! It really is delicious…Read Domenica’s comment below. She’s with you!